MoHow Posted By Joel Simms It’s amazing how some simple, easy, positive actions can improve life. Saying “Thank You” and being grateful are two examples that have enormous power. In fact, they have the power to change your life in the most profound way. My wife taught me to be grateful beginning on the first date we had. We went to restaurant and before we began to eat she asked me to pause because she wanted to say Grace. I had never done this before at any meal other than one on a religious holiday. She told me that she did it before every meal, and we’ve said grace before very meal since. I am so grateful to her! Being more grateful has affected everything in my life. I’m more appreciative and positive. I’m a better husband, father, son, brother, and friend. I’m a happier and better person, I believe. I believe being more grateful can improve anyone’s life.You won’t get the exact same benefits as I have; you’ll get yours, some will be like mine, and some will be unique to you. 1. Create a morning gratitude session. Take a minute in the morning each morning to think of the people who have done something nice for you, to think things in your life you’re grateful for. This will immediately help you start your day off right. 2. Make a gratitude list. We all have difficult days. Days we feel stressed out. When we lose a loved one. When we feel disappointed or low. One of the things that can help you feel much better is making a list of all the things you’re thankful for. There are always things to be thankful for; health, loved ones, health, having a job, having a roof over your head and clothes on your back, and being alive. 3. Instead of being angry, show gratitude. That’s a major switching of attitudes, isn’t easy to do. If you are angry with a co-worker or your spouse,, for example, because of something he or she did … take a breath and don’t react in anger. Instead, calm down, and think of reasons you’re grateful for that person. What has that person done that is nice for you? Find something, anything, even if it’s difficult. Focus on those things that make you grateful. It will slowly change your mood. 4. Instead of complaining about your children, be grateful for them. Many parents get frustrated with their children. They are too slow to do things, they have a bad attitude, they can’t clean up after themselves. Unfortunately, sometimes parents will communicate that frustration to their children too often, and the kids will begin to feel bad about themselves. Many parents have done this, and while it’s not perfect, it’s a part of parenthood. But there’s a better way: follow the method above of calming down when you’re frustrated, and thinking of reasons you’re grateful to your child. Share these reasons with your child. And then take the opportunity to teach them, instead of criticizing them. 5. When you face a major challenge, be grateful for it. Many people will see something difficult as a bad thing. If something goes wrong, it’s a reason to complain. That won’t get you anywhere. Instead, learn to be grateful for the challenge; it’s an opportunity to grow, to learn, to get better at something. This will transform you from a complainer into a positive person who only continues to improve. People will like you better and you’ll improve your career. 6. When you suffer a tragedy, be grateful for the life you still have. I’ve recently lost a very close friend. Tragedies can be crippling if you let them overcome you. I’m not saying “Don’t grieve”, I’m saying, “You can also take away something even greater from these tragedies: gratitude for the life you still have. Appreciation for the fleeting beauty of life itself. Love for the people who are still in your life.” Take this opportunity to show appreciation to these people, and to enjoy life while you can. 7. Instead of focusing on what you don’t have, look at what you do have. Have you ever looked around you and bemoaned how little you have? How the place you live isn’t your dream house, or the car you drive isn’t as nice as you’d like, or your peers have cooler gadgets or better jobs? If so, that’s an opportunity to be grateful for what you already have. It’s easy to forget that there are billions of people worse off than you, who don’t have much in the way of shelter or clothes, who don’t own a car and never will, who don’t own a gadget or even know what one is, who don’t have a job at all or only have very menial, miserable jobs in sweatshop conditions. Compare your life to these people’s lives, and be grateful for the life you have. And realize that it’s already more than enough, that happiness is not a destination — it’s already here. 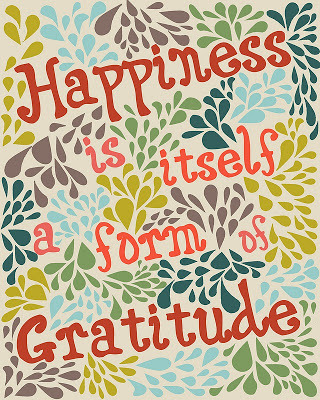 Do you have ways to develop more gratitude that work for you? If you do, please share them in the comments!